Citation: Igari S, Yamamoto T. (2016) Extensive Calcification in Eccrine Poroma. Dermatol Clin Res, 2(1): 66-67. Copyrights: ©2016 Igari S, Yamamoto T. This is an open-access article distributed under the terms of the Creative Commons Attribution License, which permits unrestricted use, distribution, and reproduction in any medium, provided the original author and source are credited. Eccrine poroma is a benign adnexal neoplasm originating from eccrine sweat ducts. Although eccrine poroma is not a rare neoplasm, calcification is a relatively rare histological feature. We describe a case of eccrine poroma occurring on the chest, which presented with extensive calcification. A 78-year-old female visited our department, complaining of an asymptomatic nodule on the chest which had existed for nearly 20 years. The tumor was slowly enlarged. Physical examination revealed a sessile-shaped, half-spherical tumor (sized 25-mm) on the left chest. The nodule was totally removed under local anesthesia. Histological features showed cords of tumor cells extending from the epidermis into the mid-dermis (Figure 1). The tumor cells had basophilic cells with small circle nuclei. 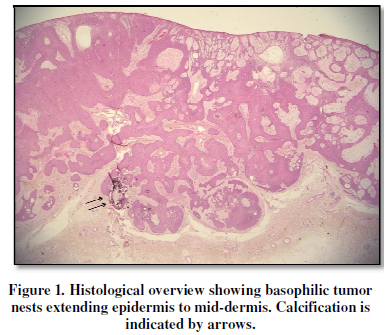 Of note, extensive calcifications with basophilic homogenous materials were observed within the tumor nests (Figure 2). 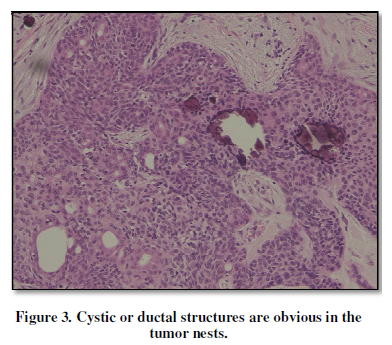 Characteristic cystic or ductal structures were also frequently seen (Figure 3). Thereafter, the patient was followed-up without local recurrence. 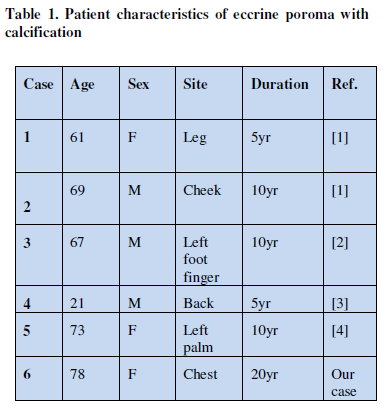 Calcification in eccrine poroma is relatively rare, and to our knowledge, only six cases have been reported including the present case [1-4]. Those cases are summarized in Table 1. Patients were elderly persons over 60 years old, except for one case. Male and female ratio was equal (1:1). The location was extremities (3 cases), trunk (2 cases), and face (1 case). 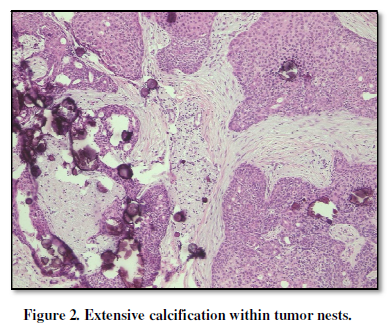 Apart from previous cases, our case showed extensive calcification in the tumor islands. Cutaneous calcification may be divided into four major categories, dystrophic, metastatic, idiopathic, and iatrogenic. The cause of secondary calcification in cutaneous neoplasms is regarded as dystrophic. Dystrophic calcification occurs as a result of tissue injury such as minor pressure or injury. A previous report examined by X-ray microanalyser showed that calcification was caused by deposition of calcium and phosphorus, with the latter dominant . In our case, the tumor appeared 20 years ago. One possibility for the induction of calcification is that long-term existence may be relevant to the induction of secondary calcification. Among the previous cases, three cases showed 10-year duration from onset, and in two cases 5-year duration was shown (Table 1). Although the number of secondary calcification in eccrine poroma is still small, further accumulation of similar cases is necessary. Yamamoto T, Irifune A, Katayama I, Nishioka K (1994) Calcification of eccrine poroma. J Dermatol 21: 979-981. Nishikawa Y, Kaneko T, Yakiyoshi N, Aizu T, Nakajima K, et al. (2009) Dermoscopy of eccrine poroma with calcification. J Dermatol Case Rep 3: 38-40.